Looking for a New Audi S5 in your area? CarGurus has 310 nationwide Audi S5 dealers with 1,841 new car listings. After getting a total makeover last year with a new powertrain, refreshed exterior design, updated interior and more driver-assisting technologies, the 2019 Audi S5 carries over with minor changes. You can expect it to hold its own against competitors like the BMW M4. The S5 certainly looks sporty, with its low stance, narrow front headlights, aggressively large front air intakes and the sleek styling lines that run along its profile. The S5 comes in both convertible and coupe forms. The convertible, which Audi calls its S5 Cabriolet, can now ride on available 20-inch wheels. The same wheels are also available for the hard top S5 with an updated Black Optic package. 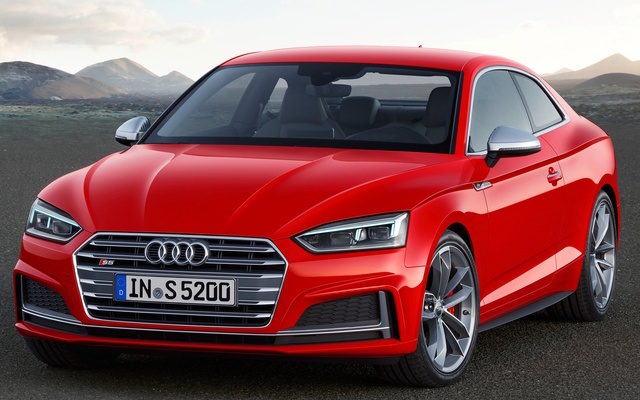 All versions of the S5 are powered by the same powertrain, a turbo-charged 3.0-liter, 6-cylinder engine mated to an 8-speed Tiptronic automatic transmission with Audi’s quattro all-wheel drive (AWD). That drivetrain produces 349 horsepower and 369 pound-feet of torque. That horsepower rating differs from last year because Audi is now using a single, global kilowatt metric. When it comes to fuel economy, the hard top S5 gets 21 mpg city, 30 highway, and 24 combined. It goes from 0-60 mph in 4.4 seconds and has a top electronically limited speed of 155 mph. The convertible S5 gets 21, 29, and 24, going from 0-60 mph in 4.8 seconds. Drivers can adjust their ride by choosing Comfort, Auto, Dynamic or Individual drive modes, which modulate the damper control, steering, and shift points. You can add the S Sport package, which features red brake calipers, a sport adaptive-damping suspension, and a sport rear differential. The soft top folds itself into a tray beneath the luggage compartment at the push of a button, as long as you aren’t going more than 31 mph. Standard exterior features for the S5 include full LED automatic headlights; LED taillights with dynamic turn signals; auto-dimming, power-folding, heated exterior mirrors; and quad exhaust outlets. The S5’s cabin is sporty without being spartan. Its features include ambient LED lighting, 3-zone climate control, an auto-dimming rearview mirror with compass, a panoramic sunroof, a flat-bottom sport steering wheel with paddle shifters, brushed aluminum inlays, stainless steel pedal caps, and a a trunk storage package that includes side nets, four cargo tie-downs, and grocery hooks to help you make the most of the 11.6 cubic feet in the trunk. When it comes to tech, the S5 comes standard with a 7-inch display for the MMI infotainment system, a 10-speaker sound system, voice controls, Apple CarPlay, Android Auto, HD Radio, Bluetooth, HomeLink garage door opener, and Audi's advanced key, which offers keyless start, stop and entry with hands-free trunk/tailgate release. If that’s not enough gadgetry for you, there’s also available options like an 8.3-inch infotainment display, a 12.3-inch color display screen with Google Earth-based navigation, a 19-speaker 755-watt Bang & Olufsen sound system, and MMI touch with handwriting recognition. Audi connect, a subscription service that delivers traffic updates, fuel prices, weather forecasts, and roadside assistance, is also available. There’s also an updated Convenience package for the S5 that includes blindspot monitoring and pre-collision warning. Park assist, which warns drivers when objects get too close during parking maneuvers, is now standard on the S5 Prestige trim. In addition to those available driver-assist systems, the S5 comes standard with Audi's Pre Sense Basic, which readies the coupe for an impending collision by closing the windows and sunroof and tightening seat belts, and automatic braking. Other standard safety features for both S5 trims include a tire-pressure monitor and power central-locking system with safety unlock feature if airbags deploy. Available safety features include lane-departure warning, rear cross-traffic assist, traffic-sign recognition and adaptive cruise control with stop-and-go and traffic-jam assist. The National Highway and Traffic Safety Administration (NHTSA) and the Insurance Institute for Highway Safety (IIHS) has not yet rated the 2019 S5. What's your take on the 2019 Audi S5? JFC2 same as last year - will wait on this model for next big changeover. John What are comparative weights? That was the original question. Have you driven a 2019 Audi S5? Enter your zip to see incentives for a new S5 in your area.